How Much Protein Should You Eat in a Day to Lose Weight? Protein should be an essential part of our lifestyle. 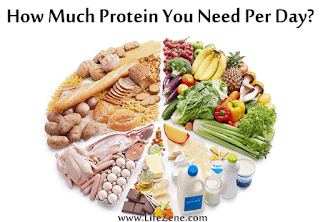 If there is a deficiency in the protein intake, our health and body composition suffers for sure. Having said that, you also have to make sure not to overdo with the protein consumption. So, what is the ideal amount of protein a person should consume per day? People have a variety of opinions on how much protein we need to consume in a day. Follow this low carb high protein diet for weight loss. Why Should We Eat Proteins? Benefits of Proteins on our Health? Well, proteins act as the main building blocks of our body. They’re responsible for making muscles, organs, tendons and skin. A lot of other internal body functions depend on the proteins and without them, we’re just spoiling our health. However, you should not worry about just the quantity of proteins, but the quality matters a lot. For example, animal proteins provide all the essential amino acids in the correct ratio, but the plant based proteins don’t provide all the necessary elements. So, if you’re vegan trying to build your body or wanted to participate in an athletic event, then you may consider taking the protein supplements to get the full benefits out of the plant based protein. According to the DRI (Dietary Reference Intake), a person should consume at least 0.8 grams of protein per 1 Kg of his/her body weight, or 0.36 grams of protein per 1 pound. So, that comes to around 60 grams per day for a 75 kg man or 52 grams per day for a 65 kg woman. In this example, we’re just considering the average sedentary person, who perform very little or no activities (desk job). Having said that, the protein goals differ from one individual to another and therefore you should use the correct formulae in order to find out the right protein intake for your body requirements. If you’re a person with Sedentary lifestyle (normal household activities or desk job), then you should consume a minimum of 0.8 grams per Kg or 0.36 grams per pound. For example, if your weight is 95 Kg, then you should eat 95 x 0.8 = 76 grams of protein per day. In pounds, it would be 209 x 0.36 = ~76 grams. There are people who’re highly active in their day to day activities, as well perform strenuous exercises like HIIT workouts, running, cardio exercises, etc.… If you’re one of such kind, then you need to eat at least 1 gram to 1.5 grams per Kg or 0.45 to 0.68 grams per pound. For example, if your weight is 85 Kg, then you need to eat a minimum of 85 x 1 = 85 grams protein per day. This can be increased to 85 x 1.5 = 128 grams if possible. Generally, the sports person or those with athletic background are extremely active and so they require a minimum of 1.5 to 2.2 grams per Kg or 0.68 to 1 gram per pound protein in a day. For example, an 80 Kg person should eat a minimum of 80 x 1.5 = 128 grams of protein per day, or a maximum of 80 x 2.2 = 176 grams. If you want to know the right protein requirement for your body, then you can head over to this DRI calculator. Note: The above protein requirement is for regular men and women. But, if you’re a pregnant woman, then you’ll need to eat an extra 10 grams of protein per day. This applies to the breastfeeding women as well. They’ll have to eat at least 15 grams above the recommended protein levels for the first 6 months. This count can be reduced to 12 grams extra per day from 7 to 12 months. How Eating Protein Helps in Weight Loss? If you don’t know, Protein plays a major role when it comes to losing weight. The general thumb rule to lose weight is to take in fewer calories than we burn. However, not many people know that eating protein helps in burning more calories than normal. It does so by boosting your metabolic rate, which is responsible for burning more calories and at the same time, regulating or reducing your appetite. An interesting fact about the protein is that it fills your stomach very quickly and makes you full for longer hours. This helps you not overeat between the meals. In a study conducted on obese men, those who ate protein at 25% of calories felt less hungry and also had less late-night cravings. The same experiment in women proved that those who increased their protein intake to 30% of calories ended up cutting their total calories by 441 and lost 11 pounds in 12 weeks. All they did was to add more protein to their existing diet. Who Should Stay Away from Consuming More Protein? You might have heard a lot of times that excess protein consumption is bad for your kidneys, as they’ve to work harder to flush them. But, there is no scientific proof that says so. The only people who need to consume less protein are those with existing kidney problems. And those with healthy kidney functioning can have the proteins without any worries. The non-vegetarians have got a variety of options when it comes to proteins. The animal proteins provide all the essential amino acids and since the animal tissues are similar to our human tissues, our body is able to make full use of them. Below are the non-vegetarian foods high in proteins. Here is a list of the protein rich foods for vegetarians. Do remember that since plant-based proteins doesn’t contain as many of the essential amino acids that animal proteins do, it is suggested to increase your protein intake by another 10% to make up for those deficiencies. Well, I’m sure you’re now convinced about the benefits of including protein rich foods in your diet! What are you waiting for then? Eat more proteins every day and lose weight naturally by boosting your metabolism. Previous Post:How Many Calories Do I Need to Lose, Maintain & Gain Weight?